In WPF, you can detect when a user is ending their Windows session by handling the Application.SessionEnding event. This occurs when the user is logging out of Windows or shutting down the machine. In your event handler, you have the ability to cancel the termination of the Windows session by setting SessionEndingCancelEventArgs.Cancel to true. 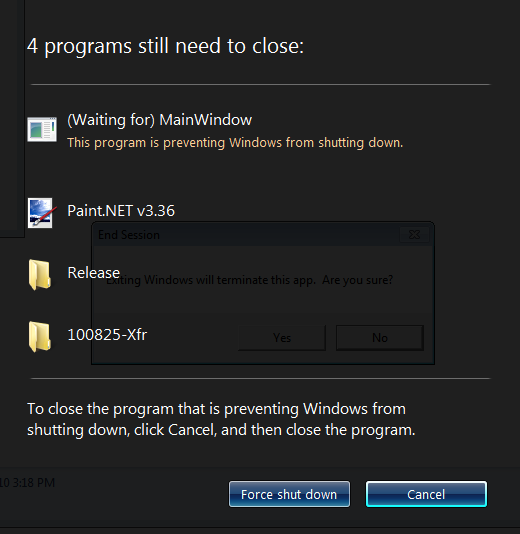 Note that this event fires when Windows is exiting, but not when the application is closed in the normal manner. Update (Jan-2011): It’s probably cleaner to just override the OnSessionEnding method in your Application-derived class, rather than adding an event handler.